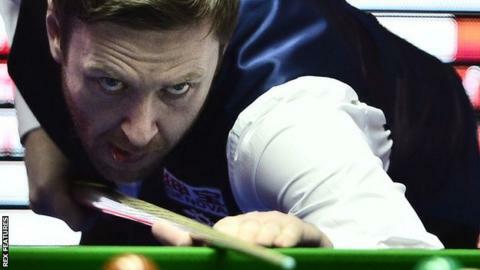 Ricky Walden is through to the China Open final after a 6-5 semi-final victory over Scotland's John Higgins. World number 10 Walden, 33, will meet England's Judd Trump in Sunday's final at Beijing University over 19 frames. It will be a second final in a week for Walden, who lost 10-6 to Mark Allen in the Players Championship on Sunday. World number seven Trump whitewashed Scotland's Stephen Maguire 6-0 in the second semi-final to reach his second ranking final of the season. Trump, 26, who was beaten 10-9 by Kyren Wilson in the final of the Shanghai Masters in September, won the opening frame with a 100 break and then raced to a 4-0 interval lead as Maguire, 35, struggled with his potting. Trump then cleared with 31 in frame five to move to the brink of victory, before completing the victory with a break of 46 in the final frame. Earlier, Walden edged a tight match against four-time world champion Higgins with a 131 break in the decider. Walden is aiming for the fourth ranking title of his career and a fourth tournament victory in China, following his wins at the 2008 Shanghai Masters, the 2012 Wuxi Classic and the 2014 International Championship. The China Open is the final ranking event before the World Championship, which begins in Sheffield on 16 April.